I swear I pay my bills … honest! Firstly it looks as though I was hit badly by comment spam. Enough traffic to cause problems on the server that hosts the site. I am currently trying to sort it out with my hosting company what caused it and what can be done. Needless to say I was muttering to myself this morning. If it happens again don’t fret we are trying to sort it and I will be back online bouncing around as soon as possible. What a way to return to blogging after a week’s break! Thanks to everyone who emailed me. I appreciated the time it takes to drop me a line. My hosting company did inform me but it happened overnight here in OZ so I was blissfully unaware and tucked up in bed. Through the week I have been adding those who have signed up to the Take a stitch Tuesday Challenge to the grand list. The exciting news is that we have a group of over 100 stitchers that are going to participate. This is wonderful because I think with that many even given drop outs there will be enough people to generate its own online group dynamics and keep going all year. There have been a few more sign ups this morning and as soon as I sort things out with this site I will add them to the page too. On the home front, a big thank you goes out to Robin of Historical Embroideress copes with modern world as I collected my mail from the post box to discover a wonderful thank you surprise. I love stash enhancement gifts that arrive out of the blue like this it is as this site takes quite a bit of energy to keep up. It also takes thought and consideration for someone else to do something like this. So Thankyou Robin and big hugs you made my day! I am so glad your back. Didn’t realise how much I would miss you. Hi Sharon! So glad you’re back. Was missing you! What a great thank you that was! 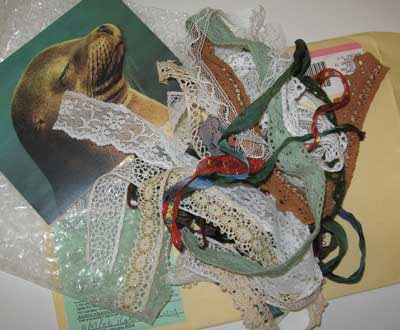 I’d love to send you some things from our next lace buy in February, but I have no idea where I’d send them. =) I’m glad you sorted out your blog problems – or they seem to be sorted out. Hope they don’t hit again. There’s some kind of bot in China that hits my site (not my blog) now and then, and shuts it down to my uploading, but others can still see it. How annoying that people do these things! It’s good to see your blog is back up and running again! Hi Sabrina – I have just added a link to your blog – sorry I did not connect the name to the blog – yikes! My pleasure to enhance your stash . I won’t be joining you on the take a stitch challenge – not because I don’t want to, but because I have only so many stitching hours and I’m already over committed for 2007 — and yes I will blog about them. Have a wonderful Christmas holiday and a healthy happy new year.